The Pro Football Hall of Fame has landed its first large private investment in a billion-dollar plan to create a village around the Canton museum. WKSU’s Tim Rudell reports. It’s an $11 million gift from Tom Benson, owner of the NFL New Orleans Saints. Most of it will go toward rebuilding historic Fawcett Stadium into an integrated complex with the Hall of Fame. The Hall’s Pete Fierle says the project is just a first step one in a far bigger concept still in the planning stages. The Hall of Fame and stadium complex would be surrounded by a high-end hotel and conference center, field houses for large events, practice facilities, residential and retail components, and interactive venues for families. Dennis Saunier, long-time President and C&O head of the Canton Area Chamber of Commerce says it can be a very big deal for the area. Fierle say, the Stadium re-build will begin next year. enshrinement and game next summer. The stadium will carry Mr. Benson’s name so it will be known as Tom Benson Hall of Fame Stadium. A million dollars of the Benson gift will also go toward Legends Landing in the Hall of Fame Village, a place for former players in need of living assistance. The HOF has needed a shot in the arm for many years and this project will go a long way to getting the attraction the attention it deserves (next: upgrade the festival! 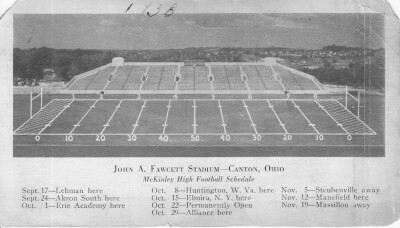 ), I question the renaming of Fawcett Stadium. Renaming a venue should be an option of last resort- used only when the original name has been sullied by a scandal involving the person for whom the venue was named. John Fawcett, a member of the Canton City School Board in the 1930s and an ardent athlete himself has been part of no known scandal. The Stadium was named to honor him. Now that honor seems temporary because he is not here to donate millions of dollars to prevent the name change. That, in itself, is a scandal.